Explorer, botanist and ethnographer Carl Friedrich von Martius, who served as Director of the Munich Botanic Garden and Professor of Botany at LMU during much of the 19th century. The approximately 25,000 specimens he collected during an extended expedition to Brazil are among the glories of the Munich collection. 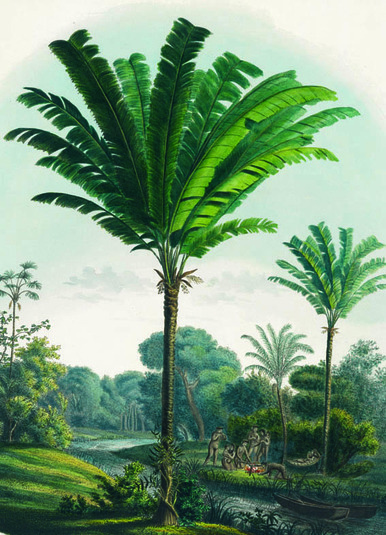 In addition he is the author of the Historia naturalis palmarum: opus tripartitum (Natural History of the Palms: a work in three parts), which appeared between 1823 and1853. The work is regarded as a milestone in the history of botanical illustration. The species shown here are Desmoncus orthacanthos and Manicaria saccifera.